1.9 Size All Terrain Off-Road tires. Fits 1.9" Bead Diameter Wheels. 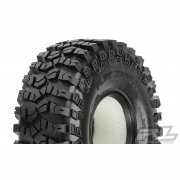 Including all 1.9 Rock Crawl..
Integy Composite Type 10H 1.9 Wheel W/Beadlock Ring & Tire, 1pr. Integy Composite Type 10H 1.9 Wheel W/Beadlock Ring & Tire, 1pr. O.D.=97mm. Silver And Black. .. The Rock Beast 1.9's are miniaturized versions of the patented Champion Pit Bull Rocker LT tires w..
ROCK BEAST® R/C 1.9 Scale Tires // (2) Two Tires per packet with (2) Two - 2 Stage Foams & (1) D..